If you’ve been following the wonderful Tanglepatterns.com site, then you probably know that Linda has just recently issued a fantastic resource to folks who’ve made a donation to the site: a pdf (complete with links) of most of the patterns collected on the site. 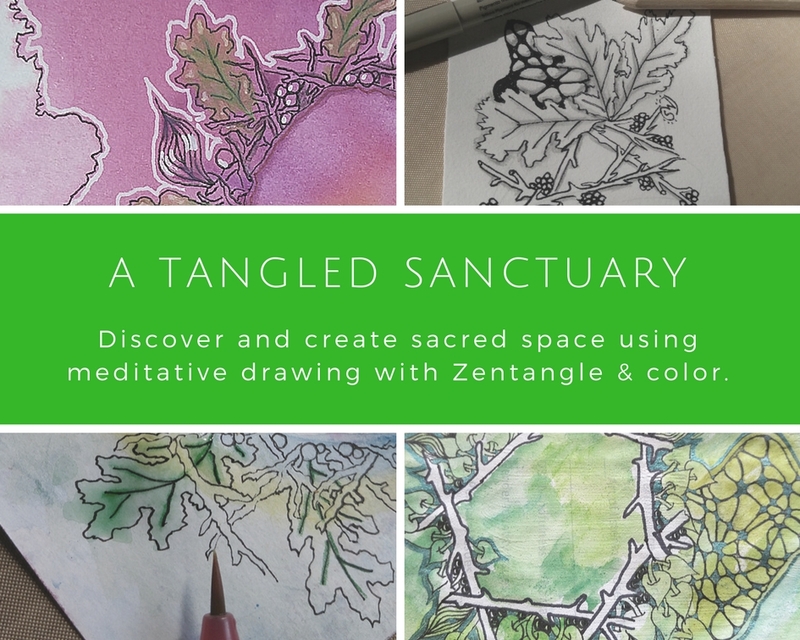 I find Linda’s site to be a wonderful collection of tangle patterns, with not just links to tangles, but articles on shading and strings even… it’s a site that you find yourself returning to over and over again, whether you’re new to Zentangle, or not. So when Linda sent the pdf out to her supporters I knew I had to make a small book out of it, to keep with my supplies and ready for reference. I’m a big fan of reusing/recycling materials, and as a CZT, I also had saved a number of my teaching demonstration sheets to use in my bookmaking forays. 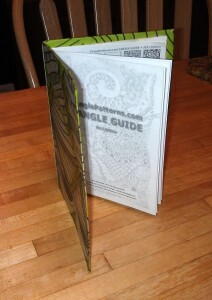 Here’s what I created using one of the sheets, an old cereal box, and the pdf, printed small, double sided…. I re-tangled the large demo tangle areas that show on the book cover, added some green highlighting with my Tombow marker, and shading, then painted on a gloss sealant. Seeing as I might be expanding this booklet in the future, if Linda updates her pdf, I decided not to use a sewn binding, but rather a simple matching green rubber band to hold the pages in place. The book size is roughly half the size, maybe a tad smaller, than an 8.5″ x 11″ book. If you use the Tanglepatterns site.. go make a donation (of $10 or more)! It’s so worth it just to keep the site going… plus you too can get this fantastic pdf! I’ve also been playing with more patterns, and upon browsing some fabric samples recently, a pattern similiar to this caught my eye… it had to be made into a tangle! I call it ‘Bandola’, after finding a pen holder / bandolier with a similiar pattern. The pattern starts with a foundation of the same strokes as in Sandy Bartholmew‘s “Coop” pattern, from her book, “Yoga for Your Brain“, but placed a bit wider apart, and then continues by extending parallel lines into the spaces created, keeping parallel to the bottom edges of each cell, but not touching in the center. I would recommend spacing the initial setup lines farther apart as you create this tangle.. and it’s definitely one where you want to pay attention to your strokes, but has lots of possibilities for fill and shading.. Enjoy.. If you find this useful.. I’d love to see what you do with it! 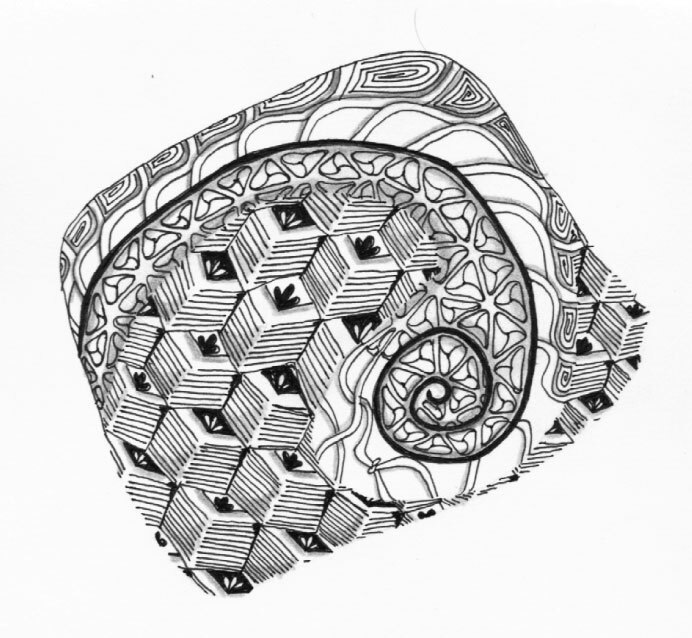 This entry was posted in Tangles, Zentangle® and tagged book, bookbinding, pattern, tangle, Zentangle®. Bookmark the permalink. 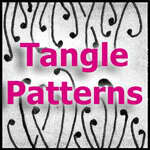 Thank you Genevieve, yes, I really appreciate all the work, love and time Linda puts into Tanglepatterns.com.. It was great meeting you yesterday. Very nice blog so much to see and so much talent to share. It was fun learning Bandola. I can see lots of uses for it. I just found your site today and love it!! Do you think you could go in to more detail, maybe even a tute, for the notebook? I love it but lack the imagination necessary to make one on my own! Thanks!! In my case I used a piece of cut cereal box that was twice the width of my folded tangle pattern pages… and I scored the inside halfway across so that I could easily fold it to be the size of the pages after covering. Hi! I love to Tangle! I found the website and saw that I could get the pattern booklet if I donated or made a purchase. 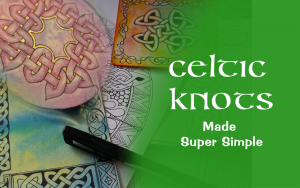 I bought the starter kit off the website, but haven’t received the pattern booklet (or link to it). I can send you a copy of the email invoice or the invoice number if you need it. Wow, this is fantastic. At first glance it reminded me of rows of books. I love to read and it made me feel right at home. Well done. Elegant and whimsical at the same time. 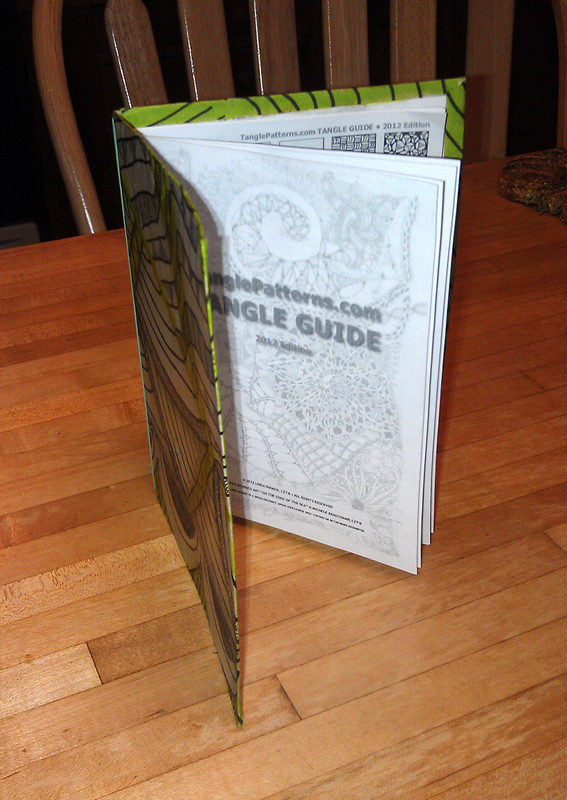 Your booklet turned out so nice! 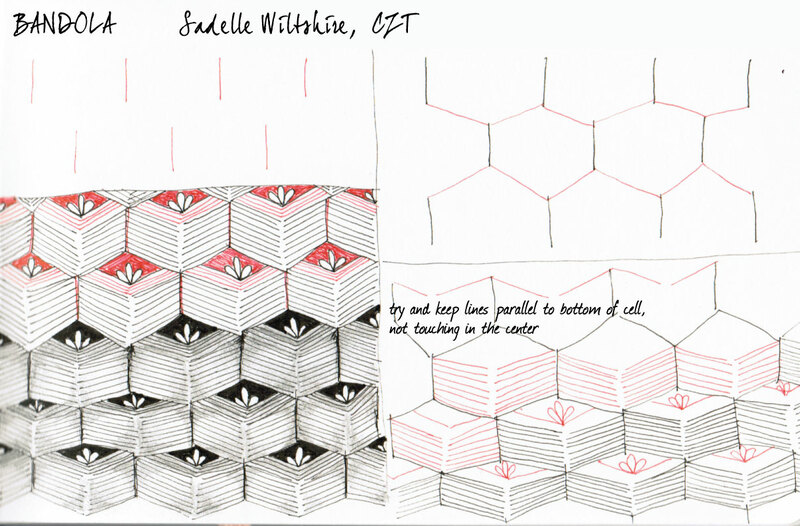 I’d love to make a little booklet of the patterns Linda put in pdf form. Normally, my program will let me create a booklet from a pdf, that keeps the pages in order when a booklet is made. But it tells me it can’t create a booklet from her pdf because it is password protected. How did you do it? Megzaela.. best I can tell you is that I fooled around with the print settings on my Mac.. I had to print page 1 separately to use as a cover, but this screen shot should be a good idea of how I began to set it up… If you’re on a pc, see if there are some hidden print settings in the print setup menu you can play with..
Bandola is a great tangle, so 3-dimensional. Thanks also for sharing your booklet idea. Love the rubber band idea to keep it expandable. Love the new tangle! And I have to make a book for my PDFs too! Thanks for the idea. I have a perpetual journal, and the pages are tied in, rather than stitched, so I think I’ll do something like that. Thanks for sharing! 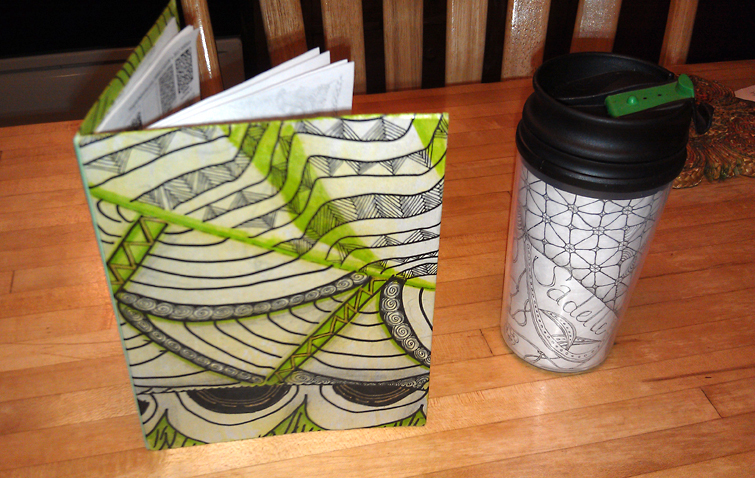 I really love the small journal: the use of just one color and the using of your tangling. Here’s my ZIA using your Bandola tangle. After I was half way thru drawing the lines, I noticed my 5.5″x5.5″ journal was upside down. So Bandola isn’t drawn like it’s illustrated, but it turned out ok. It was fun to draw Bandola! Thank you for sharing it with us. Dixie, it’s beautiful! Thank you so much for sharing your ZIA! This is so lovely. I ‘m not a gardener, but this makes me feel as if I ‘ve created a little garden of window boxes. Thanks. I love how you’ve shown your tangle in both red and black. The first thing it made me think of, though, was a display of petit fours. I’ve obviously been watching way too much of “The Great British Baking Show”! Thanks for the lovely tangle.